(CNS): Scientists undertaking marine research in Little Cayman have emphasized the importance of managing local impacts on coral reefs in the struggle to conserve these critically important marine habitats. Researchers said that reefs around the Sister Island were able to bounce back after bleaching and infectious disease between 1999 and 2004 reduced the living coral by nearly 40% because of their isolation and limited human impact. Chuck Jacoby, from the University of Florida, said the Little Cayman study demonstrated the need to protect reefs from local fishing and development if they are to survive. “Local stresses are much more manageable than the global ones, and if you get rid of the local ones, the reefs can cope,” he said. Reefs the world over are fighting to survive. While they occupy less than 0.01 percent of the marine environment, they produce about 25 percent of fish caught in developing countries and account for about 30 percent of export earnings in reef-related tourism. This research shows that limiting local stresses can allow reefs to thrive on their own and recover from even quite serious damage, but add local stresses to global impacts and the reefs will disappear. With the National Conservation Law passed in the Cayman Islands last month and due to be implemented this month, the Marine Parks Law will be repealed and become part of the NCL. The next fight for marine conservation is a revision of those parks in an attempt to cut local pressure on more of Cayman’s reefs. However, the Department of Environment is likely to face another battle to persuade people that the parks must be extended. While some scientists still believe coral reefs are headed for certain doom no matter what, the study by University of Florida and researchers from the Central Caribbean Marine Institute implies otherwise and backs the call for enhancement of the local parks. 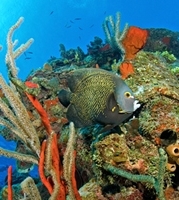 Much of the reef surrounding Little Cayman is already protected and damage from fishing, anchoring and other human activities has been minimized. So, despite the impact of climate change with the major bleaching event, the reefs have bounced back. “Little Cayman is an example of what can happen because it is essentially free from local stresses due to its isolation, small human population and generally healthy ecology,” said Jacoby. Overfishing, nutrient runoff, coral mining, tourism and coastal development have long threatened coral reefs and now global warming is accelerating the destruction. But the study’s results offer hope for coral reefs ─ if humans pay more attention to protecting them. Tom Frazer, a UF professor of aquatic ecology, said that the study shows that reefs are not a lost cause. “We believe there’s value in making sure coral reefs don’t die. “In addition to saving the living organisms that make coral reefs their homes, safeguarding the habitats could ensure millions of dollars for the fishing and tourism industries, not to mention maintaining barriers that protect coastal areas and their human inhabitants from tropical storms,” Frazer added.